Thanks to Stéphane Bogaert of Page 24, I learned that Julie Michard and her father have a brewpub and production facility in central France. 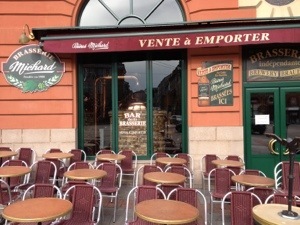 The pub is right on the central circle of Limoges, an ideal location for watching the world walk by. 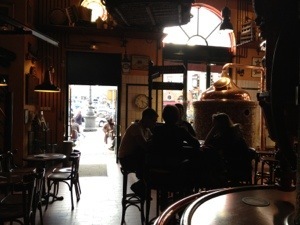 The brune was my favorite of those on tap, but the whiskey is what I shelled out euros to take home. I have a reputation to protect for bringing the can’t-get-it-here bottles to my friend’s annual whiskey tasting. A French single malt? Ding ding!